The Next Big Trend For Lips, Coming Soon To A Salon Near You! If the crowds at this weekend's Irish Beauty Show were any indication, it looks like lip foils are set to be the next big thing in beauty. The stand for The Beauty Boutique Academy - distributors of Glitzy Lips in Ireland - was drawing a lot of attention and the free product demonstrations were going down a treat. Blingin' high-shine glitter-effect lips were everywhere you turned, with the most popular colour being Pink Couture ... unsurprising really, as it's the colour Katy Perry rocked for her recent Grammy's performance. The Irish Beauty Show is Ireland's biggest beauty trade show aimed primarily at beauty therapists, spa and salon owners and nail technicians. 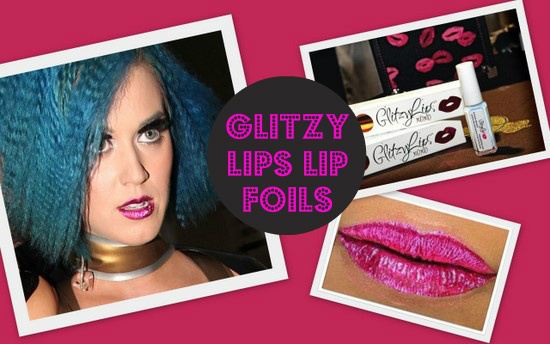 There was a lot of love for the Glitzy Lips foils, so I'd expect them to be coming soon to a salon near you. €15 is the suggested treatment price, and you apparently get up to 8 hours wear per application. There are nine colours available including red, silver, copper, blue and various shades of pink. I can't see myself pulling this trend off although it was fascinating to see so many ladies sporting their glitzy lips yesterday! I'd be afraid to smile, eat or drink! I don't think I could see myself wearing these, but I know other people that could. They could be fun for a costume or something! Not sure I would go for this, as I like to change my lip colour depending on outfits. I'm not sure I could do them but the range they have is fantastic, there was one lass with a deep vibrant red - gorgeous! I'm too chicken to try these - but I could see it suiting you Em on a big night out ! Not really sure. I'd like to thing I'd give it a go....only time will tell! Are these like the lip tattoos violent lips? I got a sparkly gold one in one of the beauty boxes, would love to try it but really don't think I am going anywhere worthy of it! I could see doing the glitzy lips for a special occasion. Saw these at the beauty show 2day I avoided the stand completely when I passed the stand and all I could smell was burning skin! It was horrid!! Not a trend I will be trying out! Honesty time: I will never, ever do this. I always go for neutral lips because I like to play up my eyes. Hmmm not so sure about this at all. Wasn't sold on the print/tatto-ish lips a while ago either. I don't think I could ever pull this off. It's far too bright and I'm too much of a chicken haha. lovely i like so much. I could NEVER wear these because they would ridiculous on me haha, mostly because any boild makeup looks always fall super flat on me. Absolutely LOVE the idea of them though, would love to see them worked into an everyday look! Hey Emma thanks for the mention! Stand was MENTAL all weekend, GlitzyLips are not going to be for absolutely everyone but anyone who was at Irish Beauty over the weekend would agree that the pinks and reds would be fab for a night out! we did over 1,000 demos in the 2 days and sold out of most of our colours so I think its save to say that the majority of people at the show were loving GlitzyLips! This is kind of a cool idea. I would give it a shot once. i'd try it. it would be fun for a night out!